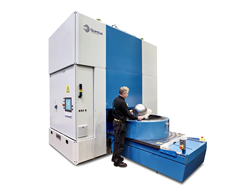 The Quintus hydroform deep-draw press gives EMI a versatile process to form parts of tough, complex-shaped metal alloys for jet engine producers General Electric and Honeywell. The new family of Quintus deep-drawing fluid cell presses is specifically aimed at the ersatility requirements within the jet engine industry. Along with excellent forming capabilities, the Quintus press requires only a single rigid tool half, significantly reducing tool costs. The other half of the tool is a flexible rubber diaphragm under uniform hydrostatic pressure. Material draw ratios of up to 3:1 eliminate several forming operations, intermediate heat treatments, and operator dependencies. The high forming pressure ensures close-tolerance parts direct from the press, with little or no secondary hand work required. Quintus Technologies specializes in the design, manufacture, installation, and support of high-pressure systems for sheet metal forming and densification of advanced materials and critical industrial components. Headquartered in Västerås, Sweden, and represented in 35 countries worldwide, the company is the world leader in high-pressure technology and has delivered more than 1,800 systems to customers across the globe within industries such as aerospace, automotive, energy, and medical implants. Read more about Quintus Technologies at http://www.quintustechnologies.com. Located in South Windsor, Conn., since 1965, Electro-Methods, Inc., is an award-winning manufacturer of complex fabricated and machined aerospace assemblies and components. With a 140,000-square-foot campus encompassing five modern buildings, Electro-Methods has long been considered a one-stop-shop by OEM customers due to the numerous special processes performed in-house, while its ability to internally control the quality and delivery of manufactured parts brings superior value to the marketplace. Known for extensive experience with concurrent engineering, EMI’s talented engineering and manufacturing teams have assisted numerous OEM partners on cutting-edge turbine engine programs, taking design concepts to production reality.